Pork is the culinary name for meat from the domestic pig (Sus domesticus), the roast pork is a particular dish of the Italian cusine named the ” Porchetta”, typical from all over center Italy. It is the most commonly consumed meat worldwide, with evidence of pig husbandry dating back to 5000 BC. Pork is eaten both freshly cooked and preserved. Curing extends the shelf life of the pork products. Ham, smoked pork, gammon, bacon and sausage are examples of preserved pork. Charcuterie is the branch of cooking devoted to prepared meat products, many from pork. 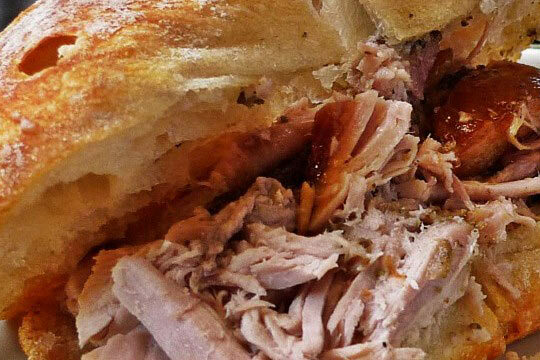 The Porchetta is a sweet roast pork that is cooked in Ariccia, a city in the middle of Italy, with flavors, at a low temperature ( 220 celsius) for a prolonged time making it sweet and tender, with crackling bronze skin, perfect for a dinner in good company, or an event or a group dinner with friends. You have to open the pig is opened from the bottom and make the boning from the inside trying not carve deep into the meat during this phase, because then even if well connected to address the process of cooking, tend to fall apart while you cut it with knife. At this stage you have to flavor the meat with the spices and salt. It starts by spreading salt on meat without excess, then put just the right amount, it must rub vigorously to allow the meat to absorb more salt. Then the whole thing is flavored with various herbs in which predominates garlic rosemary, which normally would be fresh, not dried, and if we have in the kitchen, “fennel” Wild, a plant of the family of anise, which is gathered in September in fallow fields, without any help is of no balance, relying on our good sense. This is undoubtedly one of the most important phases: cooking. 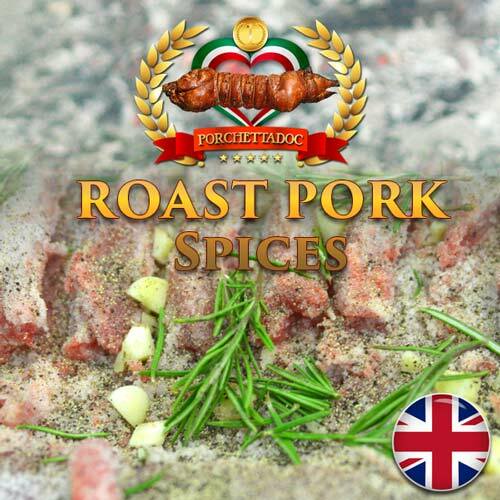 Cooking the pork is the stage where the product is characterized and gain aroma and fragrance. E ‘at this stage that the “crust” rind of the pig is crackling, and therefore retains moisture inside the casing allowing the meat to acquire organoleptic characteristics peculiar to a roast pork. Cooking should take place at about 210- 220 ° C, and adopting a strong controls alternating occurring extracting the head from the oven randomly. So will last for 6 or 8 hours and at intervals of about one hour “il porchettaro” ( the professional figure) pull the pork out of the oven cooking is primarily controlled by following the weight .Each ” porchetta” before being subjected to the process of cooking, is weighed in raw and cooked to perfection can be confirmed by a new phase of the weight to see how much weight and fat porchetta lost, wiping and running off into the collection container of lard, meanwhile cooking. Roast pork with the completion of the cooking will take on a golden color characteristic that will cause a peckish sneaky and inviting …. Let us go back over mel throughout history in search of the meaning of the word pork and origin. Obviously we can only do so thanks to that which has been handed down in the written form .Here we tried a small epistemological analysis. So this abundance of linguistic terms linked to the pig , seen through a comparative study in good part from the Indo-European languages, is connected with the remote age in which man was able to domesticate wild that animal that until then had driven. Just to confirm this view we can say that the pork and wild boar, from the genetic point of view, are of the same bloodline. And this apparent contradiction, lasting to this day in the assessments of men, will lead to the opposition’s terms sus (pig) initially used to indicate the wild animal and pork (pig) pet, slaughtered and eaten, but not the subject of game. Where did the etymology of the word “pork” ( Roast pork) ? The term sus, then, is related to the verb greek “thyein”, which means sacrifice.